We are having a great summer here. Yesterday all parts of the UK were over 30 degrees! Never got above 20 degrees here in South East Kent, lovely breezy summers day topped off with a group evening ten mile ride to a real ale pub but had to put my jacket back on in the garden!! 29 degrees once again up here in the parched desert commonly referred to as the frozen North. Had to go into town so took the Velocette. It was its turn and it did need petrol. The Star Twin will be out on Monday being road tested by editor of Classic Motorcycle. This has required a bringing forward its annual wash and polish. One good side effect, it's stopped the grass growing. The grass around here appears to be dead! all parts of the UK were over 30 degrees! all together now --- "oh no they wasn't"
Over here it is:- 32 degrees……Fahrenheit!!! That will teach you Kiwipom for being six months out of sync. Oh by the way will you make sure the summer is good as I will be in New Plymouth in February for two months. Had a few good frosts here this week but a bit better today. 10-16C, riding the A7 plunger to work today. 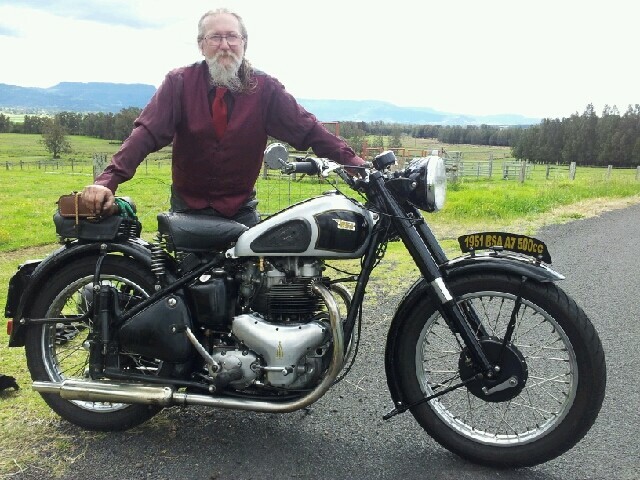 Hi Kiwipom, do you know if there are any classic bike meets near New Plymouth in February and March time. It only seems like yesterday you blokes were telling us about the snow. It's cold and wet down under ATM, brrrrrrrrr! Mr Black Sheep, could you let us know which issue of Classic Motorcycle has your Star Twin story in it. Should get an idea on Monday. It will only be a riding impression. He needs to take it for a week and ride the North Coast 500 to really find out what it's like. Real Classic 101 (sept 2012) has an in-depth feature. Totally unbiased of course as I wrote it. Hottest day we've had down here on the East Kent coast, stifling at twenty four degrees, hope the sea breeze picks up! Our max today was 29c. Looks like we are keeping this heat for the next few weeks.